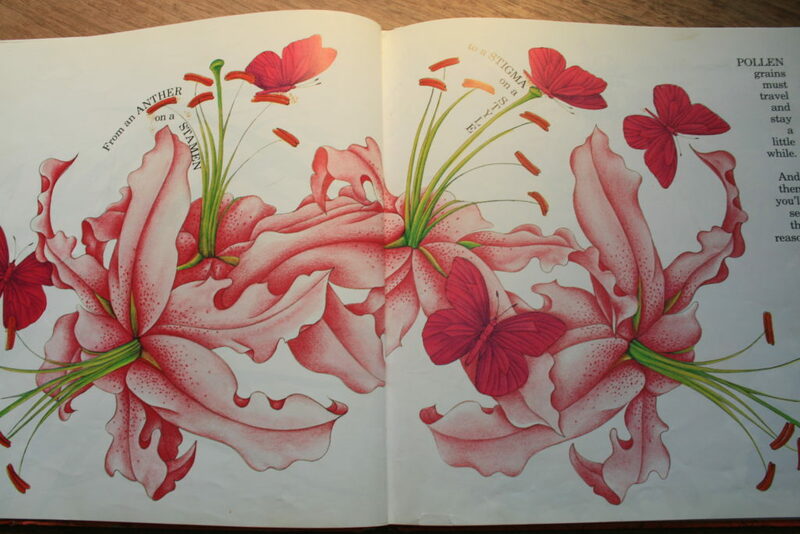 In today’s Nurtured by Nature Booklist review, I am choosing my favorite book so far out of a slew of wonderful books (including gorgeous coloring books) by author Ruth Heller. I stumbled upon one of her titles at a nature center, and such a fitting place it was to read her fun and educational work. 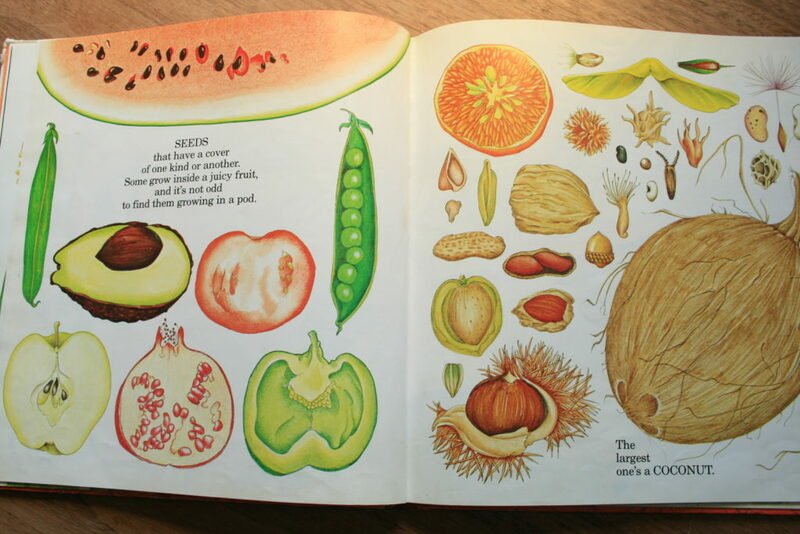 The wonderful thing about Ruth Heller’s books is that the rhymes, the rhythm and the art delight the reader in such a way that we do not even notice that we are learning all sorts of science along the way! Text load: Light – as little as half a sentence per page, sometimes a little more. The topic couldn’t be more fundamental to our existence, or more crucial at this time of big agriculture and declining bee populations. 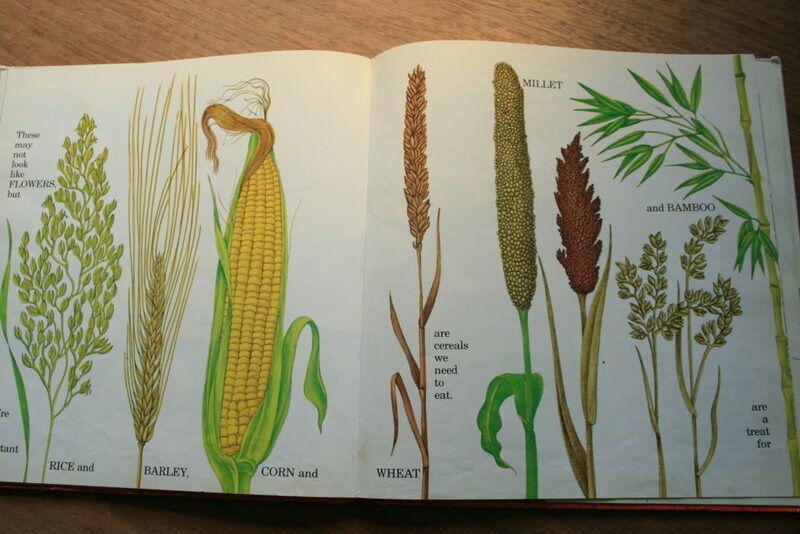 Most students usually learn the foundations of how plants reproduce and produce food for us, but it could be a lot more enjoyable with Ruth Heller’s book in your hands. This book effortlessly introduces your child to words such as “stamen” and “angiosperm.” You may have thought your child was too young, but this book will have their science gears turning. She really packs the learning in as we read about familiar grains, what seeds need to grow, what kind of plants grow in hot regions or very wet conditions, and we even learn about carnivorous plants! We enjoy all of the art with Ruth Heller’s use of bright color and geometric design. The text is rhythmic and scattered with rhymes, making this an enjoyable one for the whole family to read. On the last page of each book, Ruth Heller alludes to one of her other books with one simple phrase. 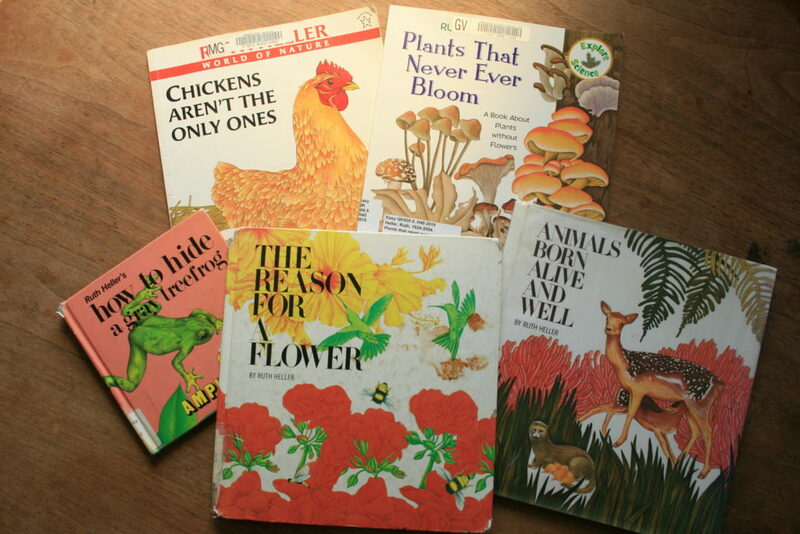 In this book, it reads, “Plants that have no flowers are fascinating, too.” You will find the book on that topic in my pile below, titled Plants That Never Ever Bloom. We adore all of these fun, educational books, and hope your family does too! Order The Reason for a Flower, or other Ruth Heller books on Amazon. Don’t forget to check out these and many more of her artistic coloring books, for child or adult!